... some bond traders have lamented the lack of high grade supply. 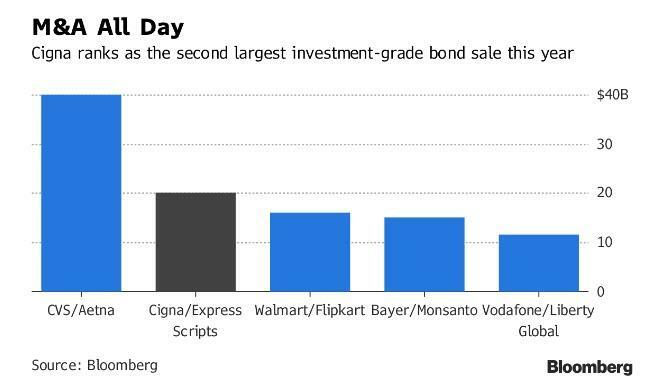 Today that changes, because Cigna is selling $20 billion of bonds to fund its takeover of Express Scripts, in what will be the U.S. corporate-bond market’s second-biggest of the year. According to Bloomberg, the health insurer is selling senior unsecured bonds in 10 parts: the longest portion of the offering, a $3 billion security maturing in 2048, is expected to yield 1.87% points above Treasuries, a sharp tightening to initial price talk which was initially at around 2.05% points. The sale is leading what’s been a busy start to September, with some strategists already raising their monthly issuance estimates. Investors, anticipating that a bulging pipeline of M&A deals would bring a wave of debt sales after the summer lull, have been selling debt the past few weeks to make room for new securities, said Travis King, head of investment-grade credit at Voya Investment Management in Atlanta. 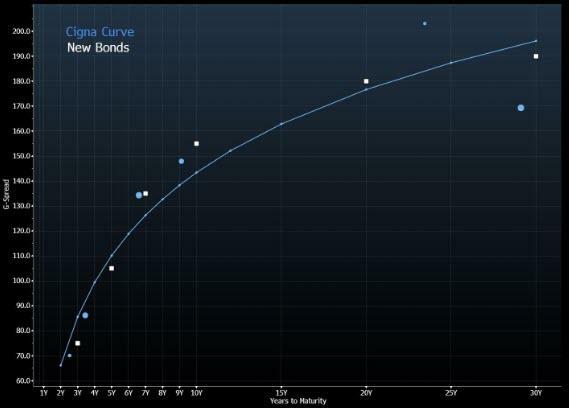 Surprisingly, or perhaps not in light of today's tech rout, treasury yields failed to drift wider due to rate locks, the expected boost in new-issue supply has boosted the amount of yield investors demand to hold corporates over govvies, and as a result, investment-grade bond spreads over Treasuries widened by a material 6 bps since the end of July to 115 basis points. The megadeal, like most other recent blockbuster bond sales, is for M&A: in March, Cigna agreed to buy Express Scripts for $54 billion in an attempt to save money for clients by bringing two branches of the health-care services sector under one roof. The deal is nearing regulatory approval, and shareholders have already cast votes in favor of the combination. Activist investor Carl Icahn, who had said it would be a “travesty” if it were to proceed, dropped his fight to block the takeover last month. While Cigna originally said it planned to issue $22.5 billion in new debt and CP to fund the deal, in addition to $26.6 billion in equity, earlier today Moody’s, S&P and CreditSights said that thanks to a ravenous bond market, the total issuance could be $23.5 billion (if not more). As part of the $2 trillion global acquisition spree, there has been a spate of jumbo M&A bond sales: CVS Health Corp. issued $40 billion of debt in March to help finance its takeover of Aetna, which remains the biggest bond sale of the year and third-largest ever in the U.S. market. Verizon's $49 billion offering in 2013, which financed the telecom giant’s acquisition of Vodafone’s stake in Verizon Wireless, still ranks as the largest ever. As Bloomberg further note, when CVS sold its bonds, it wasn’t near regulatory approval yet and a federal judge hadn’t yet made a landmark ruling to clear AT&T’s takeover of Time Warner Inc., making way for more M&A. That’s why CVS issued some of the debt at a discount, but Cigna likely won’t have to according to Matt Brill, senior portfolio manager at Invesco Ltd. The initial price talk suggests that the market won’t require a discount, and that both Cigna and its bankers feel very confident that the acquisition will go through, Brill said. “There’s more optimism in the market, and this deal should do well and create an encouraged buyer base for the rest of the month,” Brill said. 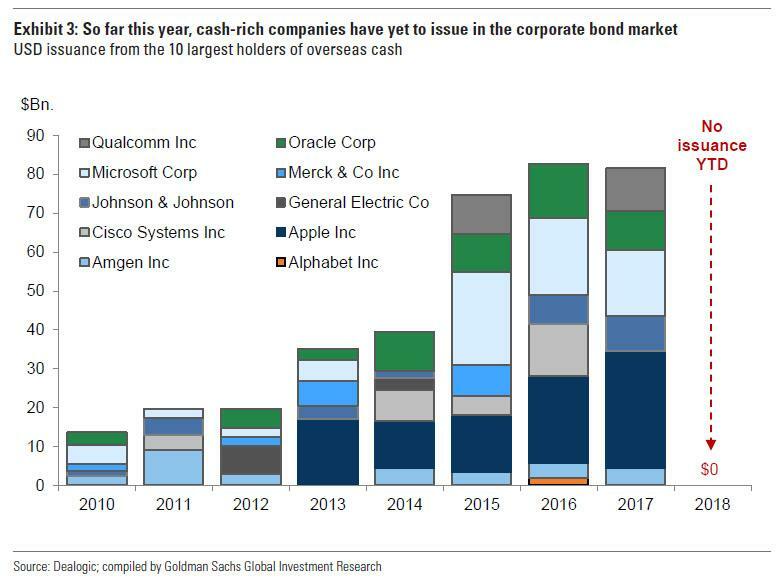 Sure enough, as the following chart from Bloomberg's Sebastian Boyd shows, the company will barely offer any concessions relative to the existing curve. As Boyd note, "that doesn't look like a struggling market."